I don’t know if you know this about me…but I am pretty much the anti-DIYer. I have nothing but admiration for my fellow DIY mommies, but it’s just not something that I have a passion for, or that I ever feel I’m motivated enough or talented enough to pull off. I’m not really that in touch with my artistic side either. Sure I’ve done a few crafts here and there, but generally you won’t see me blogging about DIY and craft projects. Something that I do love doing is taking something old and making it new. I know that DIY could fall into this category…but I when I usually have this in mind, I have someone else do the dirty work for me! You see, when I met my husband almost 9 years ago, one of the things that I absolutely LOVED about going to visit him and his family on the farm, was the over 100 year old grain elevator that towered over the yard. Isn’t it just stunning? Many people in town (5 miles away) could see it and it was definitely a landmark of our family’s farm. 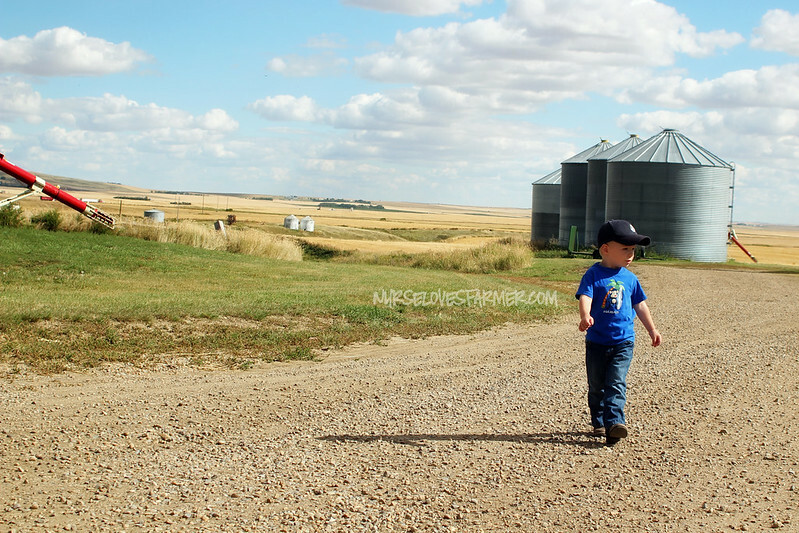 “Just look for the grain elevator” and you know you’re at the Schultz farm! Looking west of the farm, the back of the elevator. I had heard my in-laws talk for years and years that they were going to tear it down, and as soon as I heard that – I staked claim on the elevator windows. I had dreams for taking those beautiful windows which are made from fir that was almost 100 years old…and turning them into art for our country home with hopes of also turning them into heirlooms that could be passed down the generations. It will be so awesome for the elevator to continue to live on in our family. I took the window frames to a glass place in town and he put mirrors where the windows used to be. I could NOT be happier with how they turned out! Now the landscape is much different! The elevator used to stand tall on the left side of this picture where the auger (red thing!) is sticking out. Have you saved anything from your farm and upcycled it? « Ethan’s 1st Hair Cut, TurboFire, & ICED COFFEE!!! The windows look so great – what a great and unique piece of decor to add to your house! Thank you, Heather, I'm so happy we finally got them! I am so so jealous of that window! Looks great! My husband comes from a farming family (although he didn't get that gene for some reason!) and I am always wanting to steal old stuff that they have but I'm afraid they'll think I'm nuts! Maybe in a couple years lol! Thank you, Sarah! I hope you enjoy it as much as we do!